A little Wall Display inspiration for Instagram lovers…. 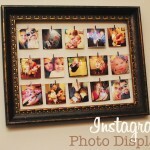 INSTAGRAM PHOTO DISPLAYS! Click each image to be taken to the site for more information on that display. If you put together a Wall Display based off of these ideas please share it on the FAN PAGE! We would LOVE to see what you came up with.